I can honestly say that I make stuffed peppers about twice each cool season, and I have never made them the same way twice. 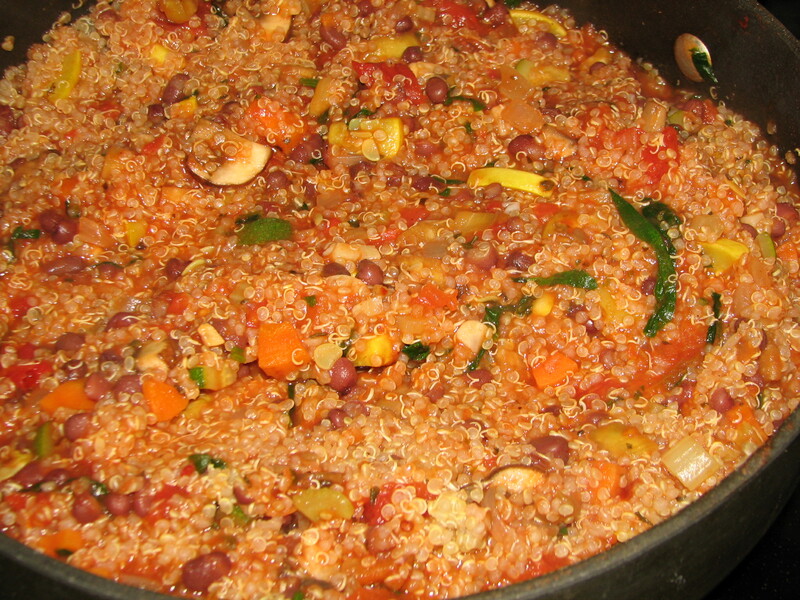 Sometimes I stuff them with quinoa & veggies, sometimes with brown rice. When I was a little girl my Mom stuffed green peppers with hamburger & rice and spaghetti sauce. Some folks use sausage in their stuffing. What I am trying to say is that there’s no limit to the flavor combinations you can make. Note: none of these ingredients are set in stone. If you don’t like something- leave it out. 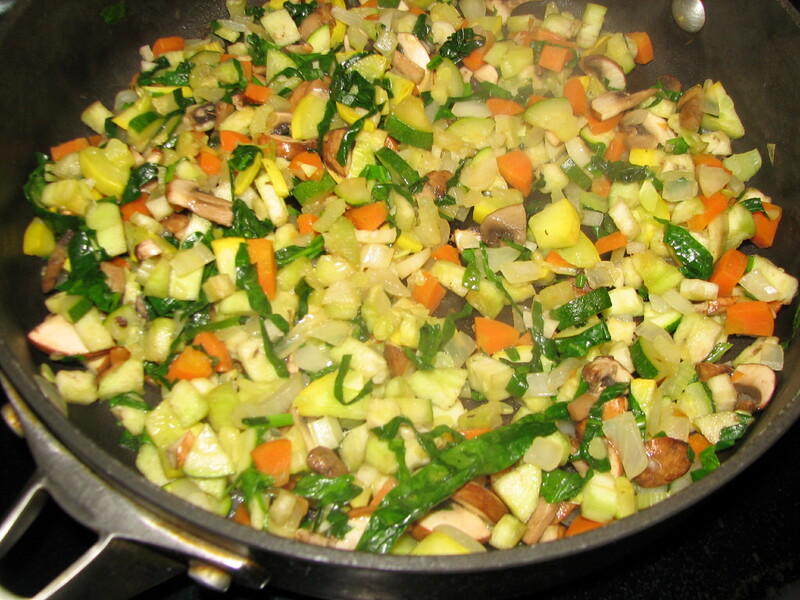 If you want to add things like artichoke hearts, olives, peas, broccoli, fresh tomatoes, anything– just add them. 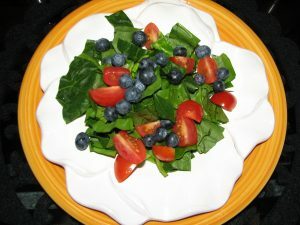 We had the peppers as a second course, after spinach salads with blueberries & tomatoes. This entry was posted in All Posts, beans, eggplant, low-fat, mushrooms, quinoa, red pepper, spinach, summer squash, tomato, vegetarian, zucchini and tagged beans, eggplant, low-fat, mushrooms, quinoa, red pepper, spinach, summer squash, tomato, vegetarian, zucchini. Yesterday’s Farmer’s market had the best selection of fruits and vegetables yet this year, so I stocked up. I had fresh garlic and eggplant, summer squash and zucchini, farm fresh eggs, and the list could go on and on. A few nights ago my sister-in-law was over for dinner and talking about spaghetti and meatballs (which I love). 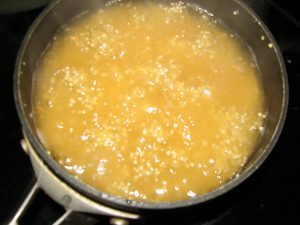 I decided that I would make myself some meatballs this week so I grabbed some ground turkey breast meat at the grocery store. Since Duncan woke me up at 6:00 this morning I had nothing else to do before the rest of the human world awakes, so I decided to get started on those meatballs. 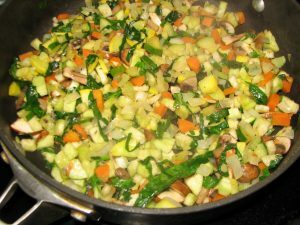 I began with a saute of celery, onion, and shallot and added to that mushrooms, summer squash, zucchini, eggplant, baby spinach, fresh basil, and assorted dried herbs. 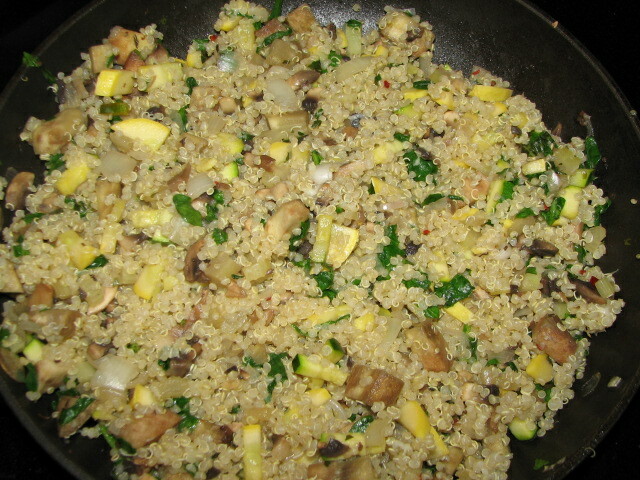 Then I tossed in some cooked quinoa and shaved over a bit of Pecorino Romano. I took about half of this mixture and tossed it in with my ground turkey, added an egg and some herbed bread crumbs and made meatballs. 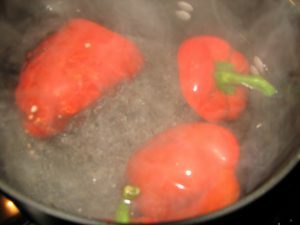 I think that I’ll mix the other half with some tomato sauce for a stuffed pepper mixture. If it doesn’t make it into a pepper it’ll be because I ate it as a side dish to eggplant stackers. 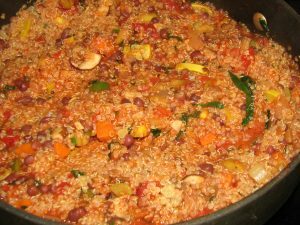 This entry was posted in All Posts, eggplant, quinoa, spinach, summer squash, turkey, zucchini and tagged eggplant, quinoa, spinach, summer squash, turkey, zucchini.